If we will prepare tempting soups of the scraps of meat, bones, etc., we will aid in preventing the habit of over-eating, to which our progress in civilization has led us. Formerly very simple diet was found satisfactory, but now the four corners of the earth are ransacked to supply us with the things which will most tempt our appetites. Soup may aid in overcoming the habit of rapid eating, if not of overeating, for, if taken at the beginning of the meal, it is very satisfying. 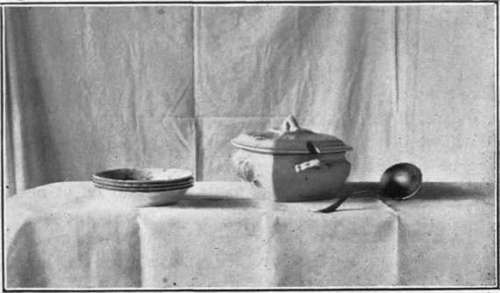 Soup is ready to at once be absorbed by the vessels of the stomach, and therefore relieves the feeling of hunger, and hence one becomes inclined to eat more leisurely. To be successful in soup making, the cook must know the taste of a good soup, and make that the guide in strength, flavor, and seasoning. Use up all the scraps of meat, either cooked or raw, but cook them separately, that is, cook the raw meat a little before putting the cooked meat into the kettle. Meat broths cooked in this way should not be flavored, and should be seasoned with salt only. They are conveniently used in gravies and purees when there is not a sufficient quantity to form a soup for a meal, and, if flavored, they would be spoiled for this purpose. . A great many soups are made without the previous preparation of a distinct stock; but stock is the base of many soups, and its manner of compounding is essential to a perfect understanding of soup making. Stock is the juices and the soluble parts of meat, bone, etc., held in the water in which they have been drawn out by proper cooking. This liquid has, when cold, a pleasant, meat-like flavor, and a jelly-like consistency, owing to the harmonious combination of the materials of which it is composed, and the gelatine which has been drawn from the cartilagenous portions. The lean portions alone will not form a jelly. It is for this reason that round of beef only is used in making bouillon to be served cold. The stock will have a better flavor if the bones and meat are in small pieces when put to cook, as the water will thus remove more of the soluble parts. Select a shin or shank of beef containing as much lean meat as bone, and, to get the best results, cut the meat into small pieces, and have the bone sawed in short lengths, and put to cook in cold water. This will allow the water to draw more flavor from both meat and bone. Use with this any trimmings or tough pieces of raw meat, provided it is beef. Put the meat into the kettle and pour in cold water to cover one inch deep. Add about half the amount of salt it will probably need, let heat up gently, and when hot, simmer for several hours. After it has cooked for four hours, put into a spider, with some hot ham or bacon fat, a pint of onions, carrots, parsnips, and white turnips mixed in equal parts, and cook until brown. Put into the soup kettle, rinse the spider, and pour the contents into the kettle, and let simmer half an hour. Pour the contents of the kettle into a colander. When the stock has all drained out, set aside to cool. Leave the grease over the top unless wishing to use the soup right away, because the fat causes it to keep better. Remove the cold fat in a lump. If you have not time to let cool, pour a little cold water into the hot soup to aid in bringing the fat at once to the top, dip off what you can, and remove the rest with paper, placing white or unglazed paper, a piece at a time, on the surface of the liquid. The liquid should be of an amber color, and will be if the vegetables are browned enough. Always save the rinsings from the roasting pans for gravies. Cook peppercorns with meat, allowing three peppercorns to a quart of water in making soup stock (if pepper is desired) as this gives the flavor of pepper without the cloudy appearance necessary with ground pepper. It is wise to place an asbestos mat under the soup kettle. It is much better to have soup stock cook slowly, and the asbestos mat aids in preventing too great heat, after the contents are all thoroughly heated through, in the kettle.